Read four books between June 25-August 16, 2018. Enter the titles on your reading log, then visit the Reference Desk to pick up your free t-shirt. New this year, an End-of-Summer Reading raffle for all participants who have read at least 4 books. CHILDREN Ages 2-5; not entering K: LIBRARIES ROCK! The Summer Reading Club runs from June 25-August 16. Children are encourage to spend time each day listening or reading stories. track your reading using the paper READING CALENDAR, available in the Children's Department and on the library website. YOU MUST BRING THE PAPER READING CALENDAR TO THE LIBRARY EACH TIME. Children who created an account before July 22 may continue to log BOOKS online. 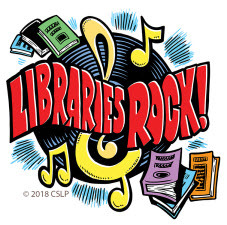 CHILDREN Entering grades K-6: LIBRARIES ROCK! The Summer Reading Club runs from June 25-August 16. 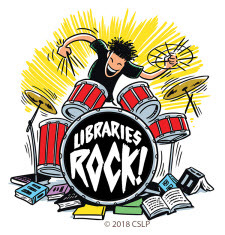 Elementary school children are challenged to read each day this summer and track your reading using the paper READING CALENDAR, found in the RED BOOKLET distributed at all of the elementary schools and available on the library website. YOU MUST BRING THE PAPER READING CALENDAR TO THE LIBRARY EACH TIME. Please record the books you have read for the Governor’s Summer Reading Challenge on the paper Reading Log. Children who created an account before July 22 may continue to log BOOKS online. 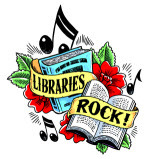 TEEN - Entering Grades 7-12: LIBRARIES ROCK! Start recording books read beginning on June 25, 2018. You will earn your Summer Reading t-shirt after reading your first book, and be entered into weekly drawings for gift cards to local businesses with every additional book entry. Three grand prizes will be awarded to lucky participants via random drawing at the end of the program.